In addition to appearing on the UK’s Best Workplaces list for the past two years, Baird has been recognised for the past 14 years on FORTUNE magazine’s list of the 100 Best Companies to Work For in the U.S. This year, Baird ranked no. 4 on the list, its fourth consecutive year in the Top 10. Baird is an employee-owned, international wealth management, capital markets, private equity and asset management firm with offices in the United States, Europe and Asia. Established in 1919, Baird has more than 3,400 associates serving the needs of individual, corporate, institutional and municipal clients. Baird has $171billion in client assets. 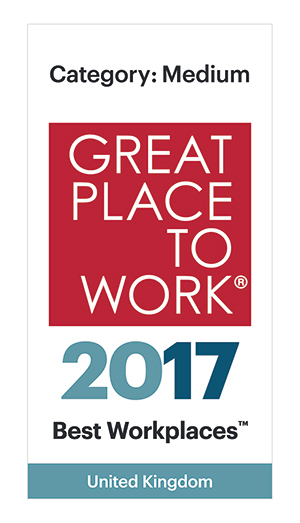 Committed to being a great place to work, Baird ranked No. 4 on FORTUNE’s 100 Best Companies to Work For in 2017 – its 14th consecutive year on the list. Baird is the marketing name of Baird Financial Group. Baird’s principal operating subsidiaries are Robert W. Baird & Co. in the United States and Robert W. Baird Group Ltd. in Europe. Baird also has an operating subsidiary in Asia supporting Baird’s investment banking and private equity operations. Robert W. Baird Limited and Baird Capital Partners Europe Limited are authorised and regulated by the Financial Conduct Authority. For more information, please visit Baird’s Web site at www.rwbaird.com.